Today I visited Tg Rimau at Sentosa for a purpose in mind. I wanted to check out on the security barriers placed on this shore and have a visual update since my last visit in April 2013. 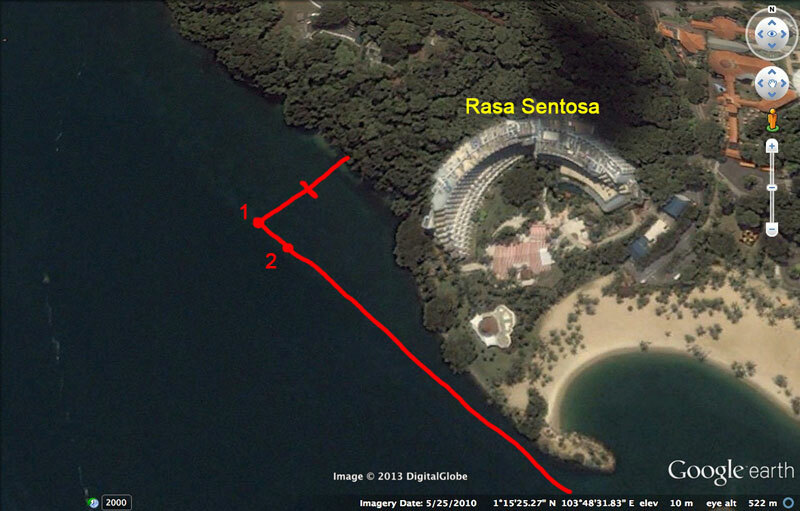 It was a chilly and windy short walk to the shore, located right next to Shangri-La Rasa Sentosa Resort & Spa Singapore. Even the water was cold early in the morning. I was rather astound by the sight when I reached the beach. Tg Rimau with the security barrier visible on the shore. The security barrier line looked very different from what I saw in April 2013, which I blogged about it in my post here. Very clear from the two images, the outline formed by the security barrier has changed A LOT within 4 months. Ria also posted an image near this location in June 2013, from a spot nearby and you can see barrier line has already changed. The original security barriers line started of just parallel to the shoreline, ending off with a sea buoy as seen in this image taken by Ria in January 2013. 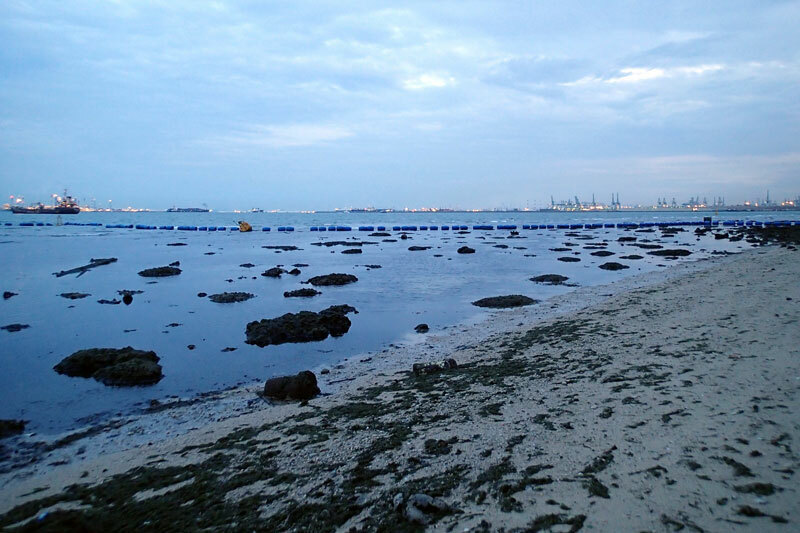 When I first checked out the situation in April 2013, there was an additional line of floating barriers starting from sea buoy 1 running perpendicular to the shore and the end of this line was anchored to large rocks on the high shore. 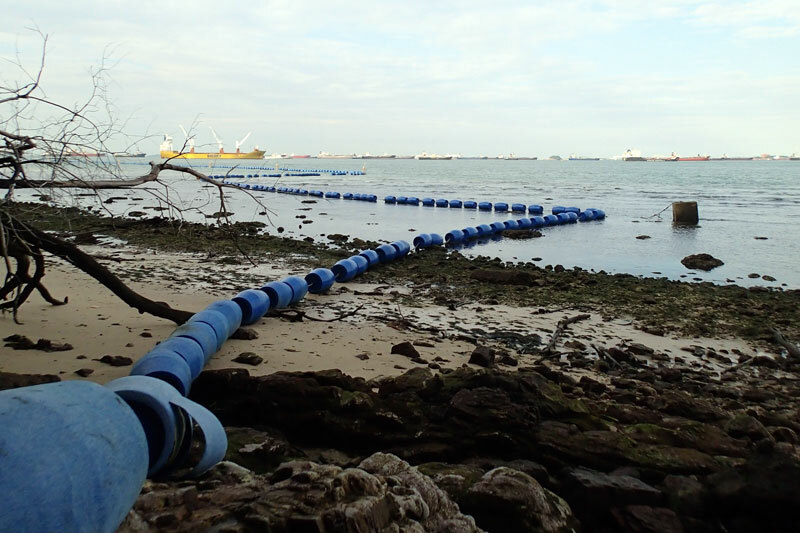 The line of security barriers formed a perpendicular connection from the shore and along the coastline. The image from Google Earth show an estimate outline in April, drawn red. 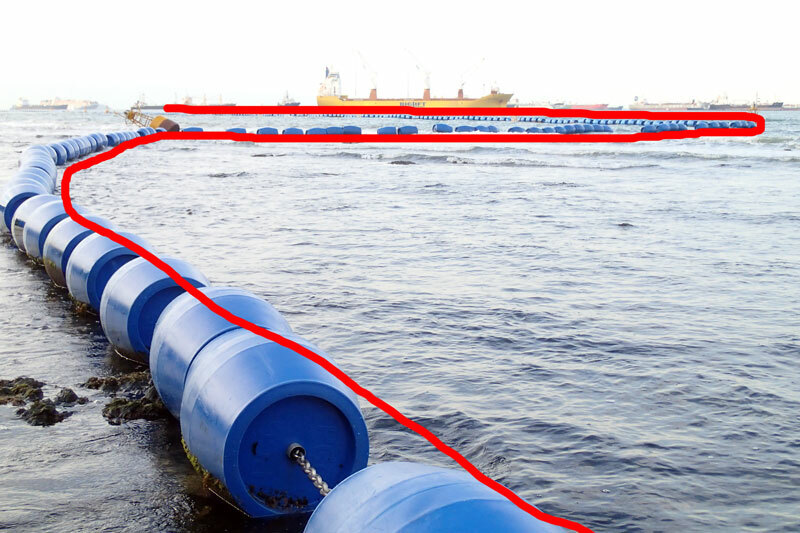 The numbers "1" and "2" denotes the sea buoy along the barrier line while the strike refers to the concrete cube. Rough outline of the barriers in red, April 2013. Today, Buoy 1 at the ending corner was seen diagonally inwards towards the shore and perpendicular to the second sea buoy. Refer to the Google Earth image for a clearer idea of the changed barrier line. New rough outline, August 2013. Looking at the position of Buoy 1 and how it is sitting tilted on the coral rubble area made me want to find out more what exactly is going on to this barrier line. 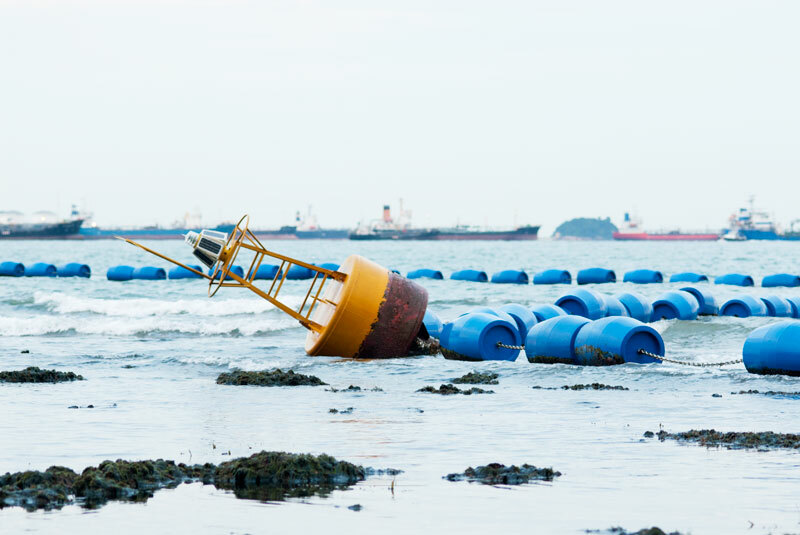 Buoy 1 is tilted and looks seated on the rubble area. Here is a video showing an overview of the floating barriers. There was a challenge in getting near the barriers. 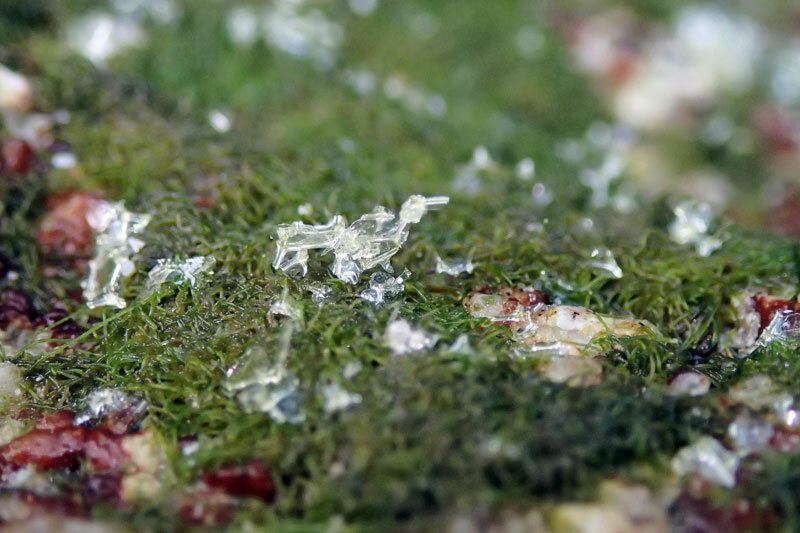 The whole shore at Tg Rimau was heavily covered with Hairy green seaweeds (Bryopsis sp.). It increased the difficulty level in walking on the coral rubble area as I could not see what I am stepping on. 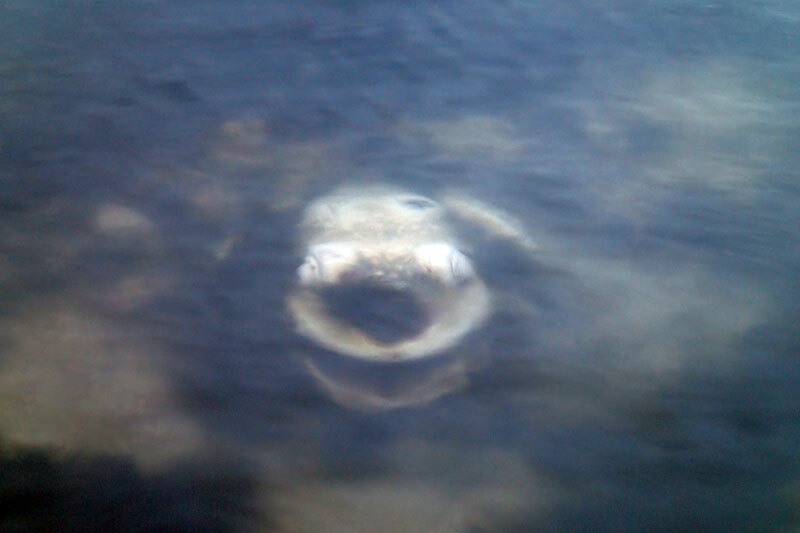 Furthermore, there have been encounters with Mr Stonefish on this shore by shore visitors. With vigilant eyes and careful walking, I made it to the barriers. During the previous trip, I did not do a careful observation of the blue drums. Today, I noticed that are marked with the letters "PCG". 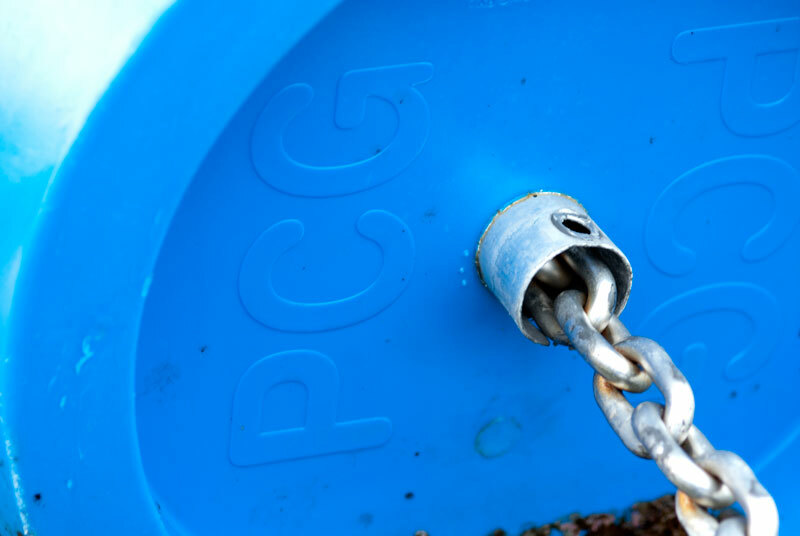 A simple search reveals that "PCG" stands for Police Coast Guard. "PCG" marked on the floating drums. 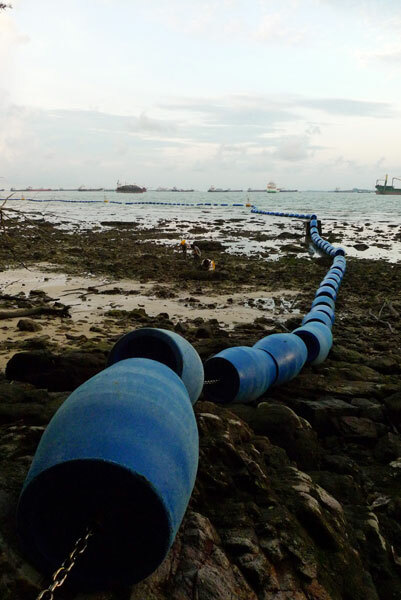 From an online newspaper article, these floating sea barriers were installed to 'deter illegal landing'. Even Buoy 1 is marked using spray paint. I assume that the number marking is number identification purpose. 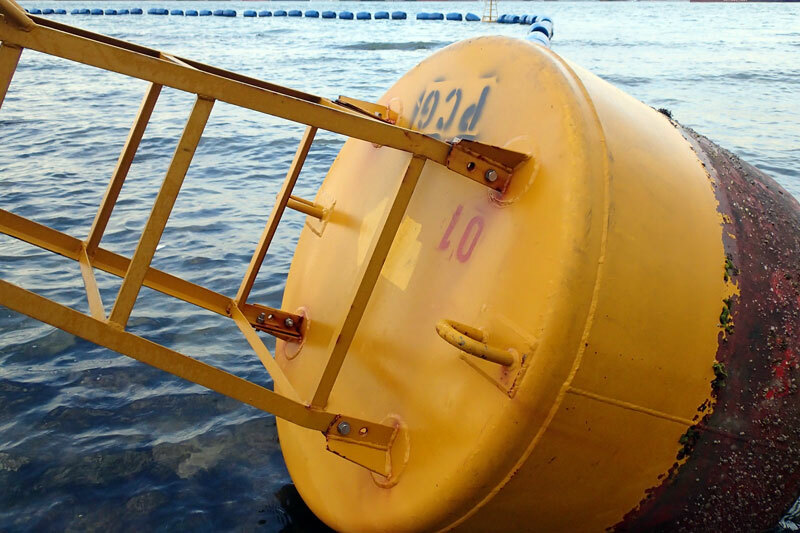 As I approach Buoy 1 from the floating barriers, I noticed the buoy has a extended base and it is visible in the shallow water as the tide goes out. I suppose this extension at the base helps to keep the buoy upright when the water level is deep enough for it to float. Visible extension at the base. 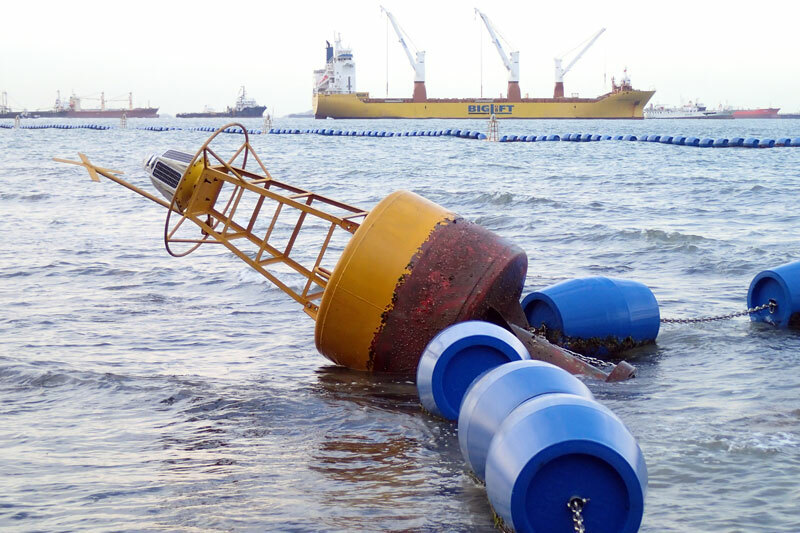 A closer inspection of Buoy 1 shows that due to the receding tide and the extension at the base, the buoy is unable to settle at the rubble area in a upright position. Hence it has to tilt to settle and probably during the cause of it crushing many animals, corals or burrows as it lands on the substrate. This repeats about twice per day due to the tide cycle. 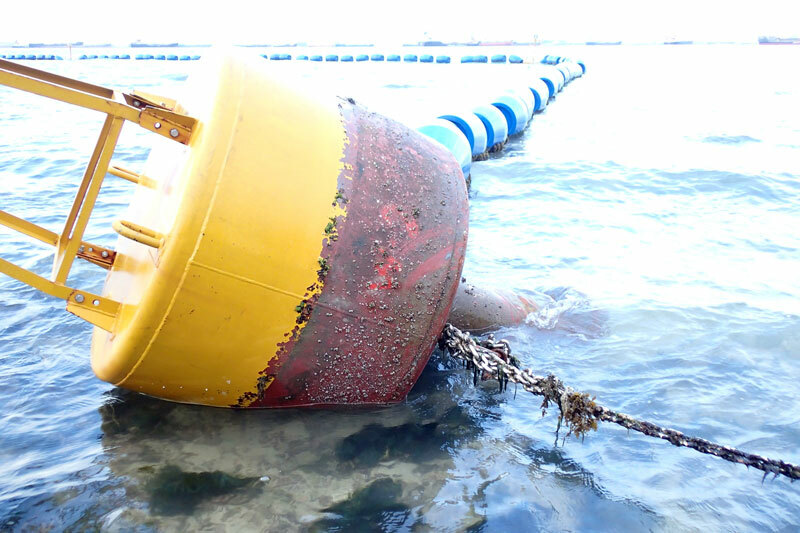 Closer look at the resting position of the buoy. 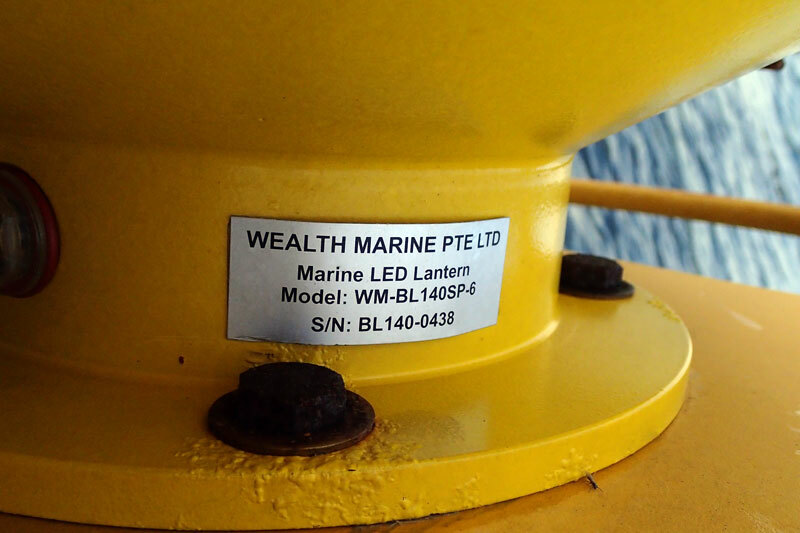 The buoy comes with solar panel LED blinking light and serial number. 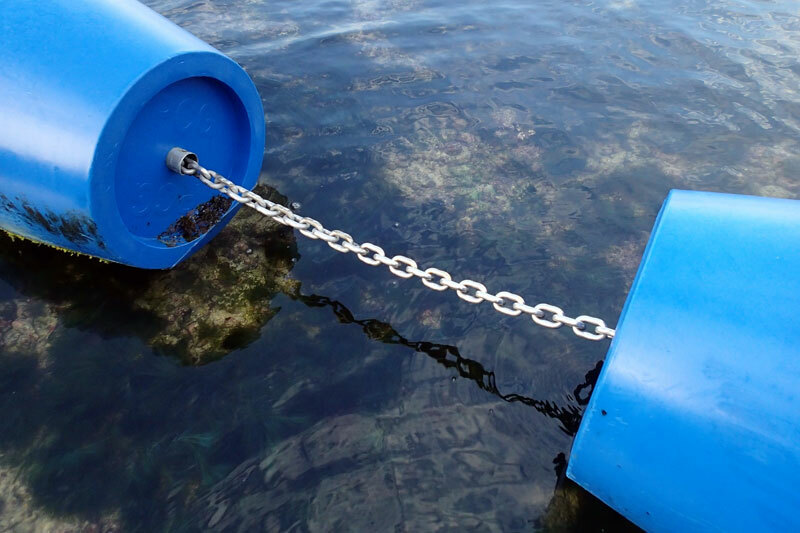 Other than chains connecting the buoy to the floating barriers, there is also a long run of chains at the base of the buoy to somewhere. More chains by the sides at the base, not connected to the floating barriers. 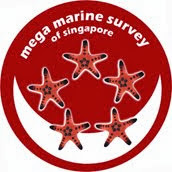 I guess the white mass in the center could be some coral. 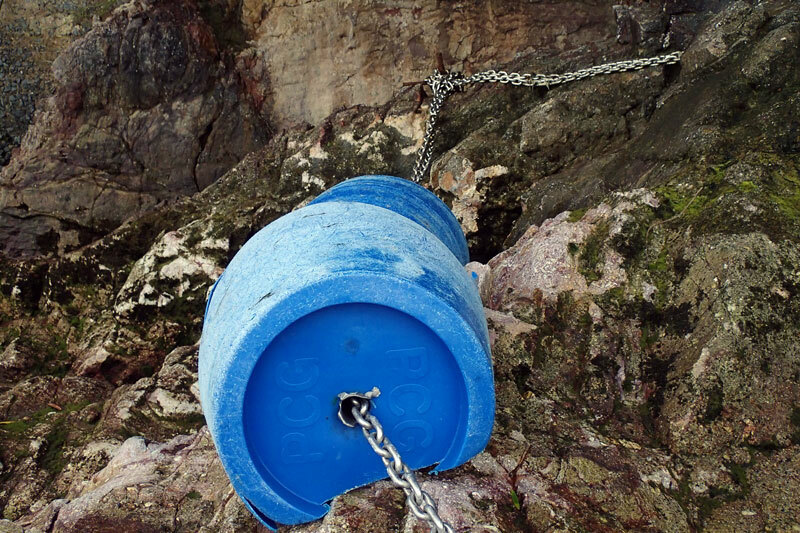 The chains that connect from the buoy base and probably anchored to the ground somewhere further down. 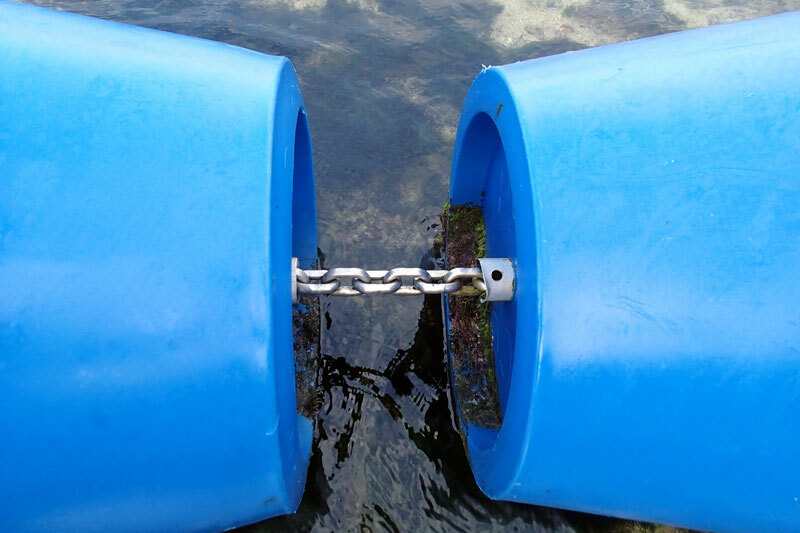 As for the floating barriers, they are connected with chains of various lengths. 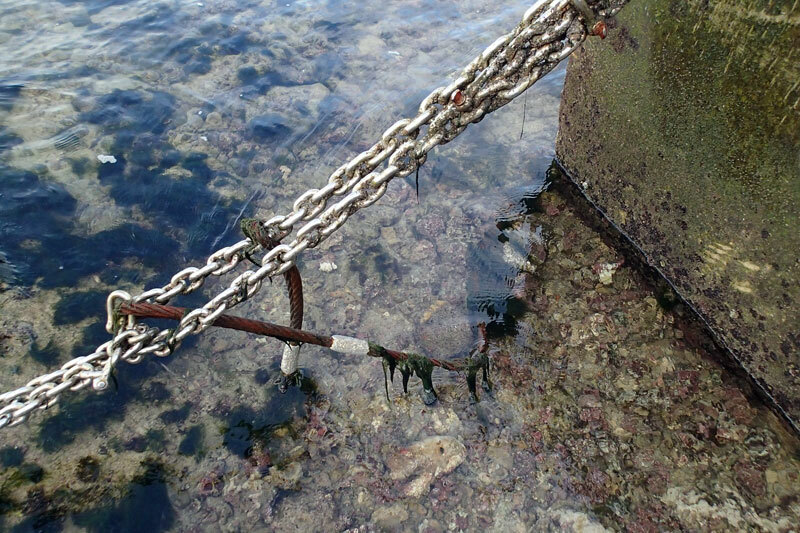 Chains of closely connected floating barriers. 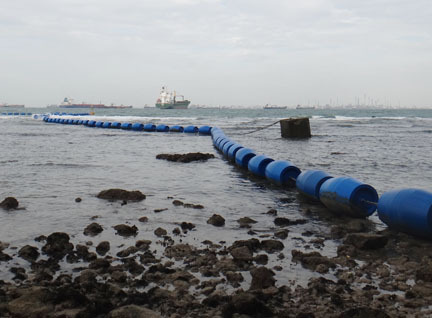 Some floating barriers shows obvious signs of impact on the reef. 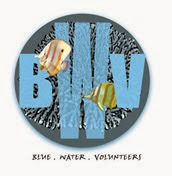 White patches on the reef where the floating barrier scrapes. 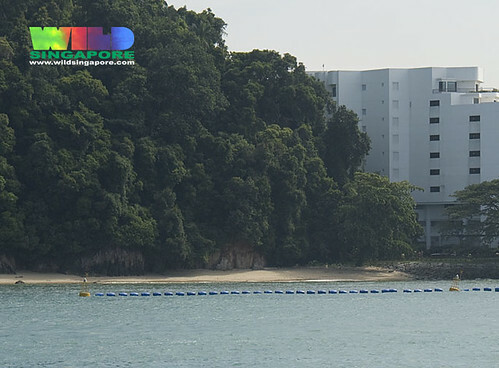 With Tg Rimau facing a heavy sea traffic of ferry and boat services, the large waves generated by sea transportation will magnify the impact of the floating barriers on the reef. This video shows how the floating barriers move with the large waves generated by a ferry service. 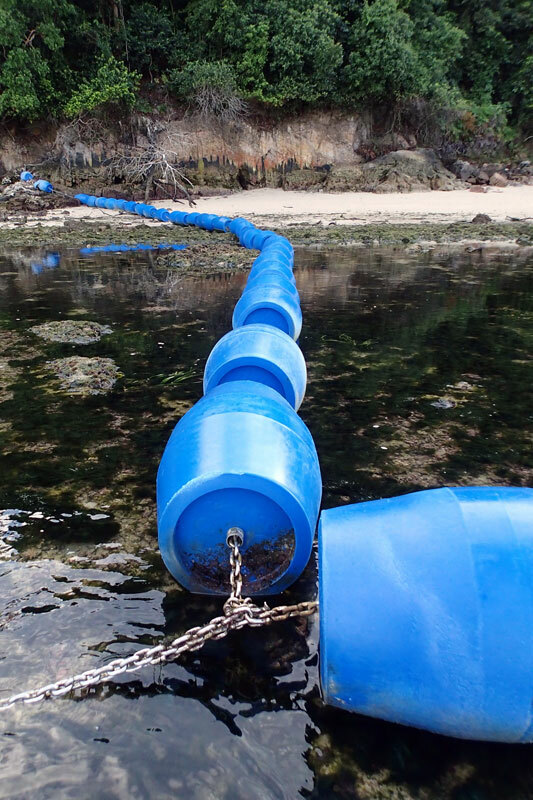 While this video shows how one of the floating barriers is impacting the reef. 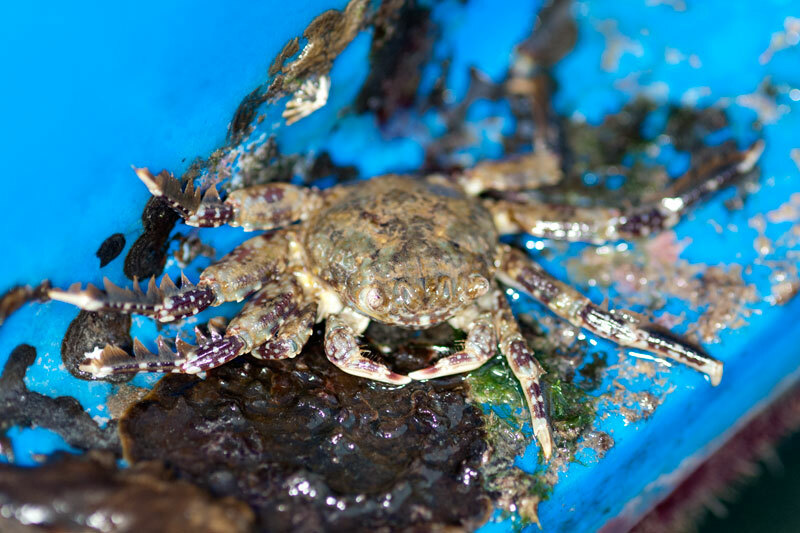 A Pimply sally-light-foot crab (Plagusia squamosa) used a side of the floating barrier as a temporary resting place, sharing it with limpets and tiny marine snails. Walking along the floating barrier line towards high shore, I came to the concrete cube where the additional floating barrier line was. Here's a comparison between April 2013 and August 2013 (today). April 2013, floating drum laid on top of the concrete cube. 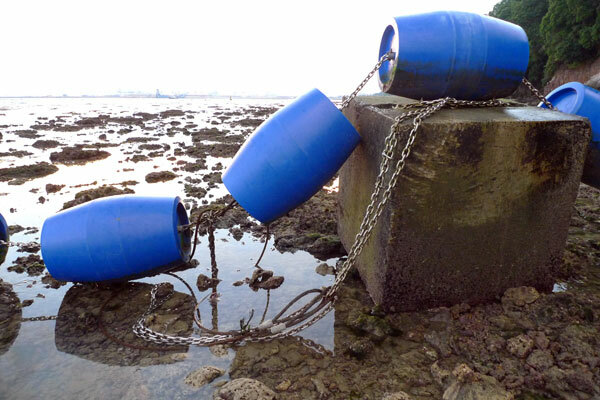 August 2013, floating drums are in front of the concrete cube but still attached to it though a chain. 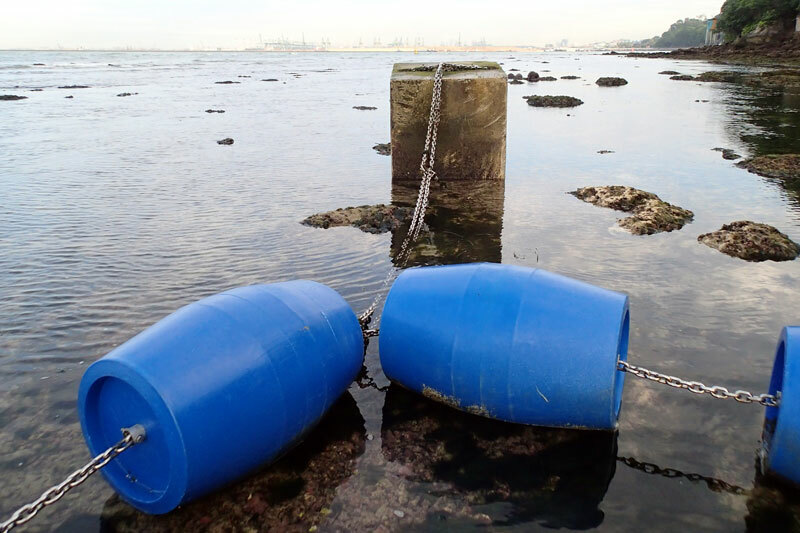 The chain from the concrete cube to the floating barriers lay across a patch of Tape seagrass (Enhalus acoroides). 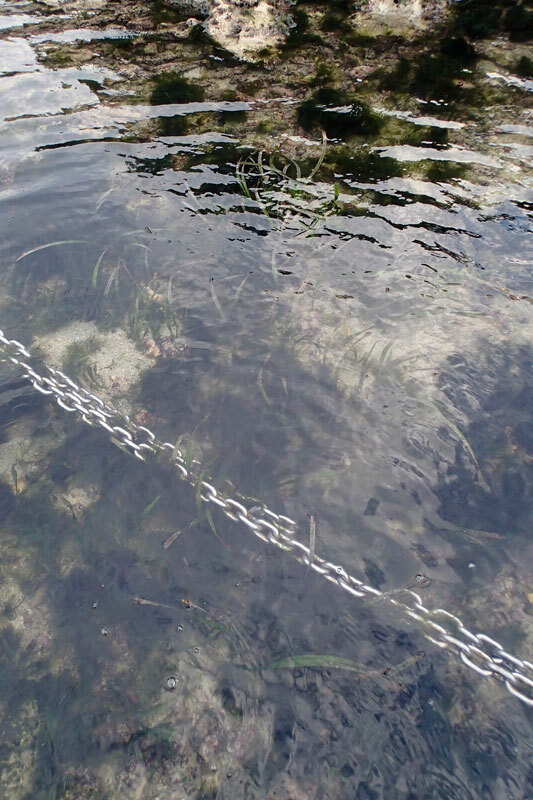 Chain falling on a patch of Tape seagrass. 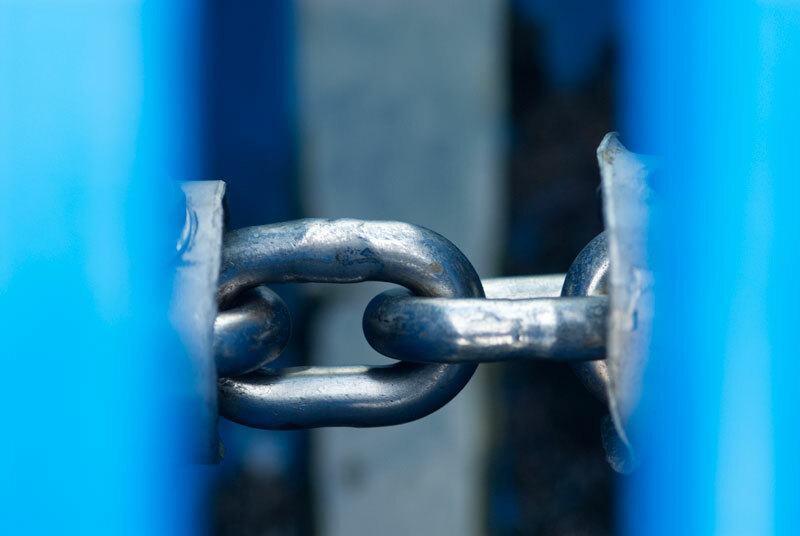 And to the chain near the concrete cube, the heavy duty metal cable loops through and is already rusting. Heavy duty metal cable loops though the chain. Standing in front of the concrete cube, the floating barrier line looks like this. The red line helps to trace the barrier line with buoy 1 along the way. Tracing of floating barrier from the concrete cube. Turning anticlockwise from this spot, the floating barriers lead me to the high shore. Things on the high shore looks much worst than on the reef. The floating barriers are dry on the surface, badly scratched and broken, revealing the barrier's content. Torn part of the barrier, showing the white content inside. This barrier looks like it has undergone multiple scraping with the rocks until a flat surface at the scraping zone is formed. 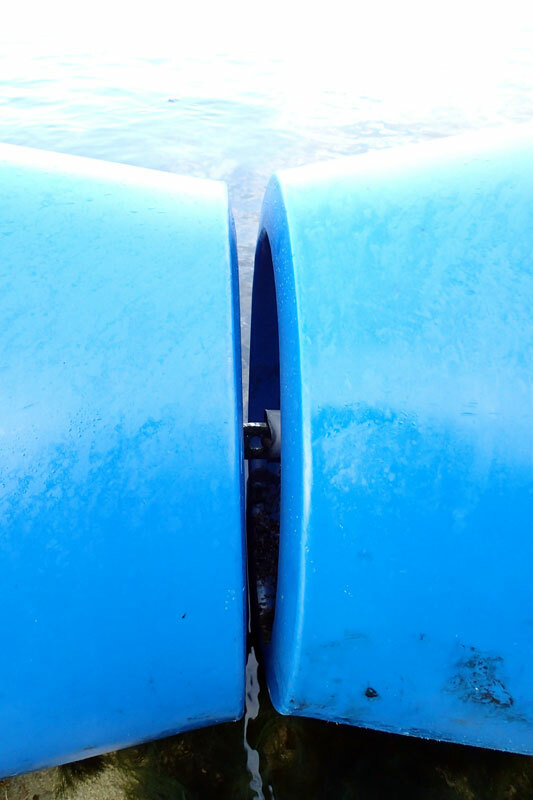 Flat contact surface on the barrier. 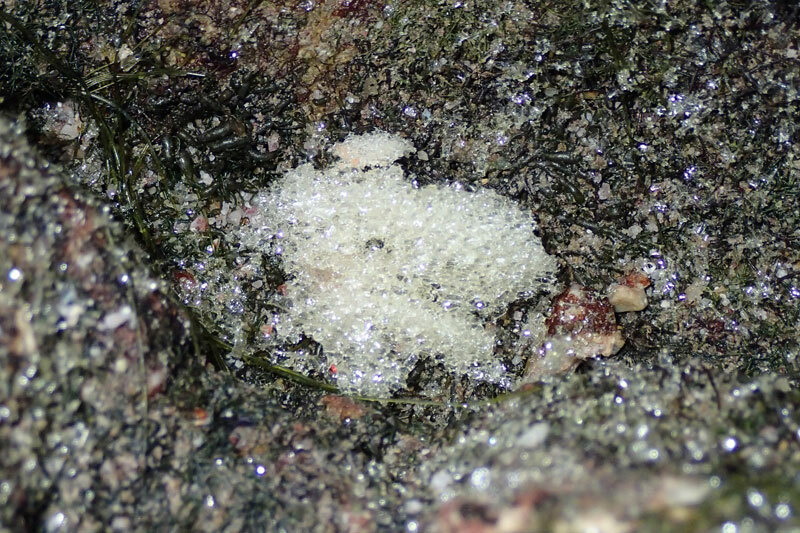 The content of the barrier looked and felt like some industrial foam packed inside and it is slowly disintegrating, scattering the tiny foam pieces all over the rocks. The whole barrier is packed with the white material. It is some type of thick foam. 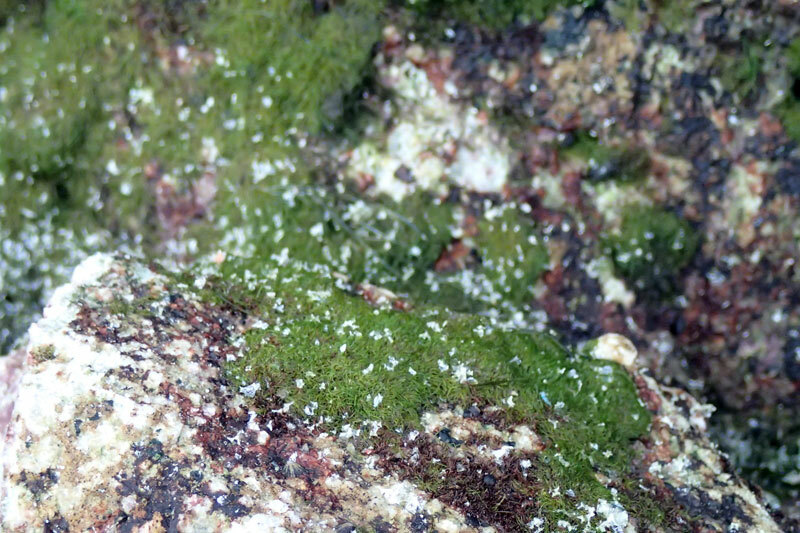 Tiny bits of disintegrated foam scattered on the algae covered rocks. Larger piece of foam on the rock. 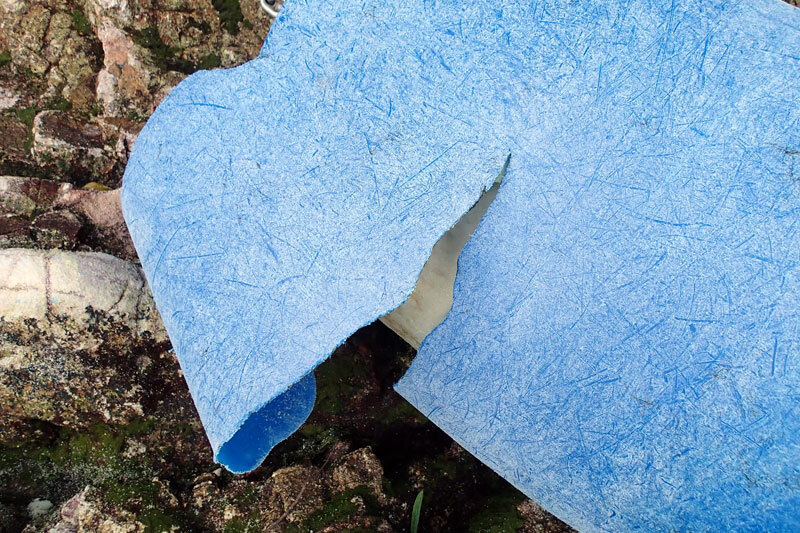 It is unsure if this material is biodegradable. Do the foam bits have the same categorisation or impact as Styrofoam bits when looking from the marine trash point of view? 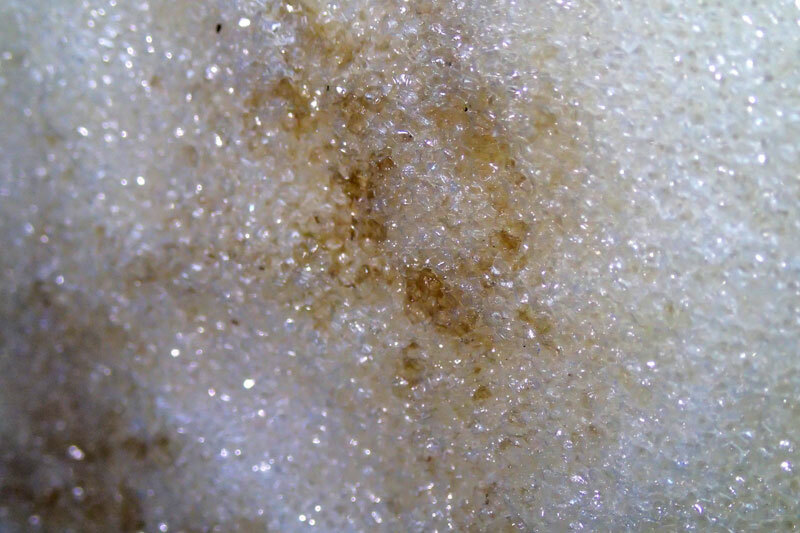 Are the tiny bits posing a threat similar to the microbeads in body wash? 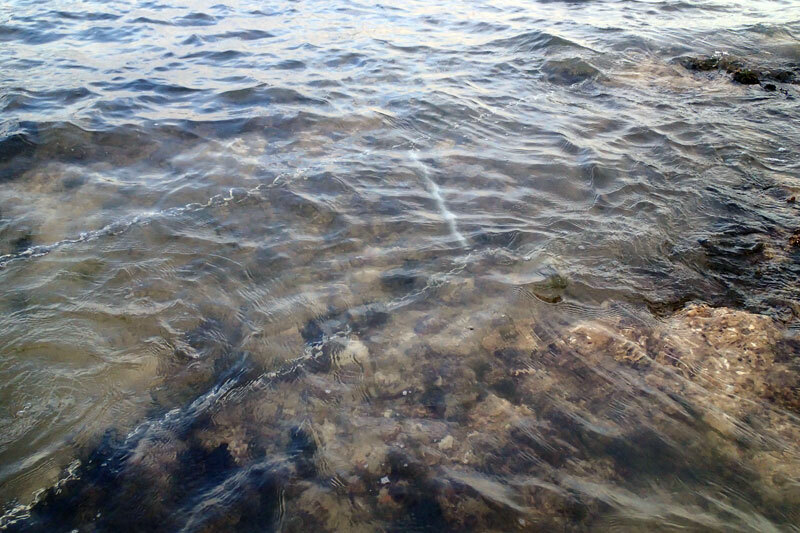 While walking along the floating barrier, I spotted something among the coral rubble. Something long, shiny and has groves. It is a long bolt. It is not just any ordinary bolt. 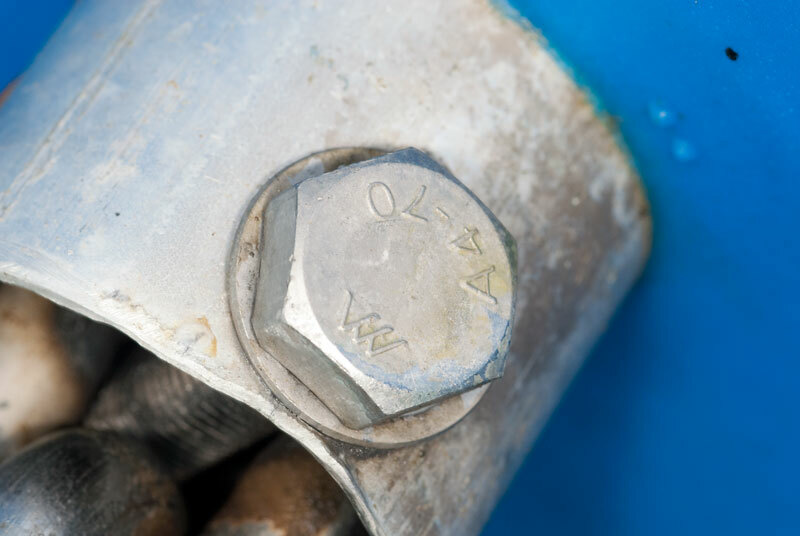 The imprint on the bolt head matched those used on the floating barriers. This is very suspicious. 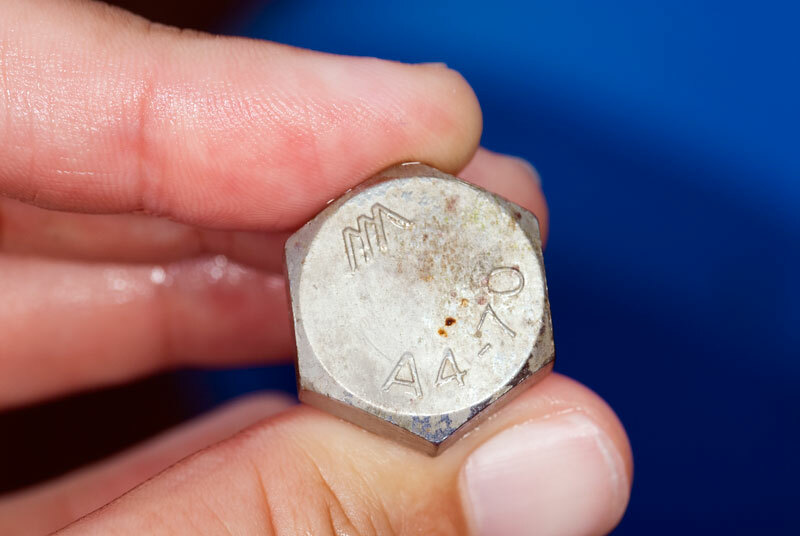 Imprint on the bolt head. 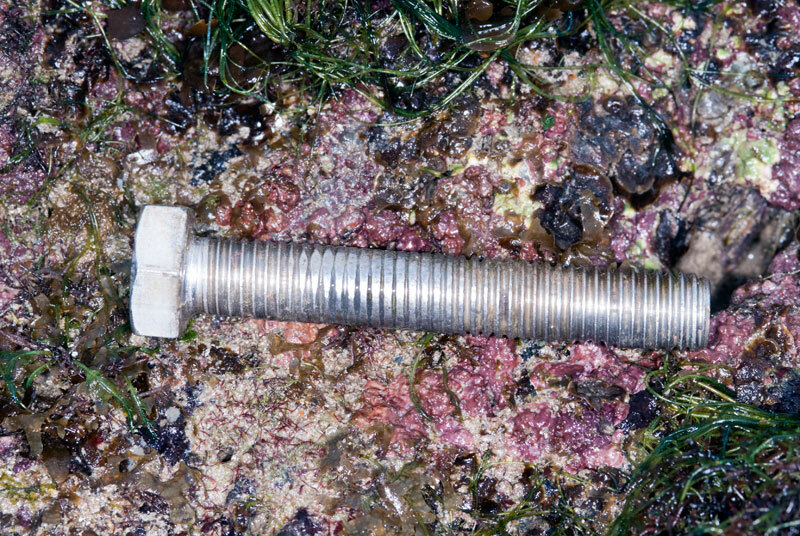 Bolt head used on the floating barrier. It matched the head of the found bolt on the rubble. There are some questions running through my mind. 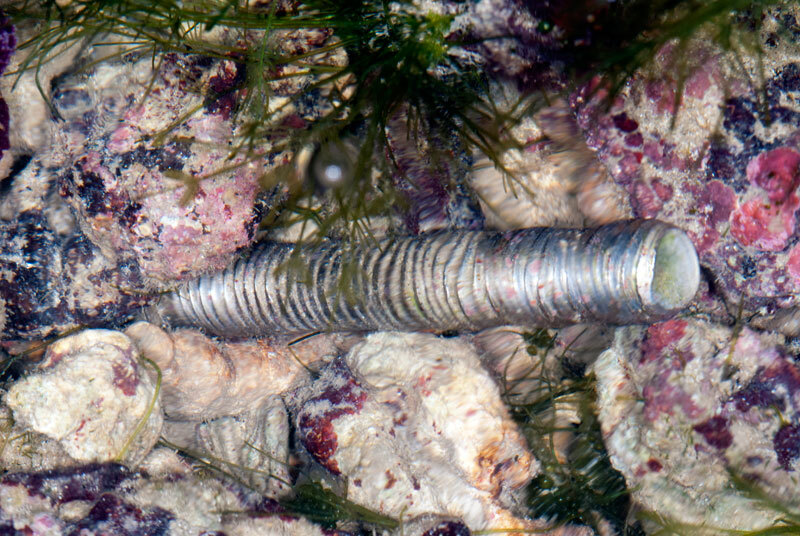 The found bolt in the coral rubble. Does it mean some form of maintenance of the floating barriers took place? 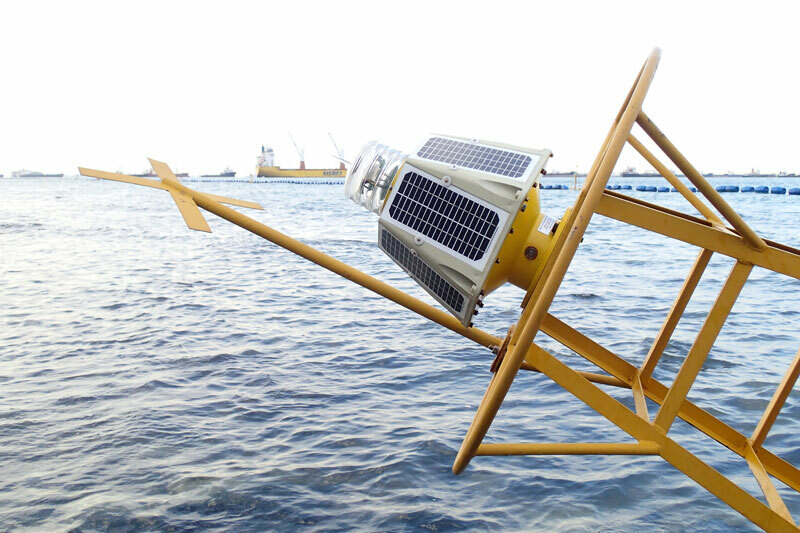 How did Buoy 1 shifted from the original position to the current location? Was it shifted purposely or the waves brought it in? 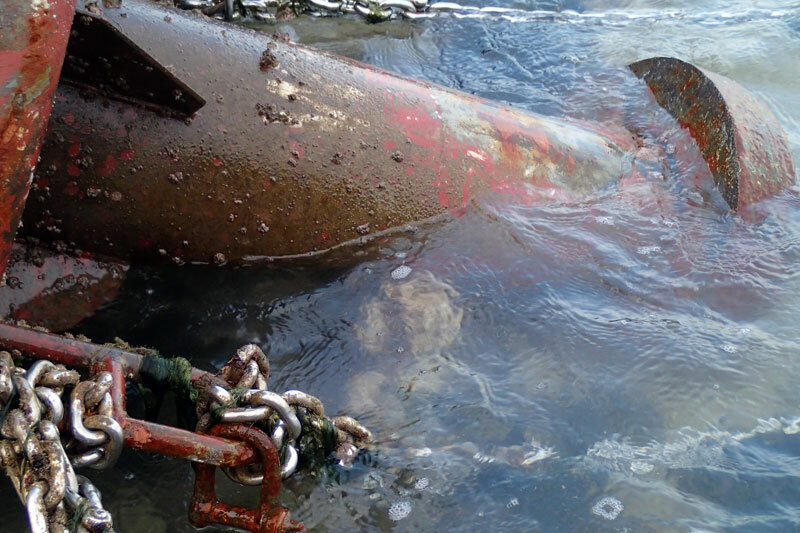 Are the relevant authorities aware of the broken barriers situation on the high shore? At the moment, it is difficult for me to judge whether the floating barriers have deleterious effect on the reef at Tg Rimau. 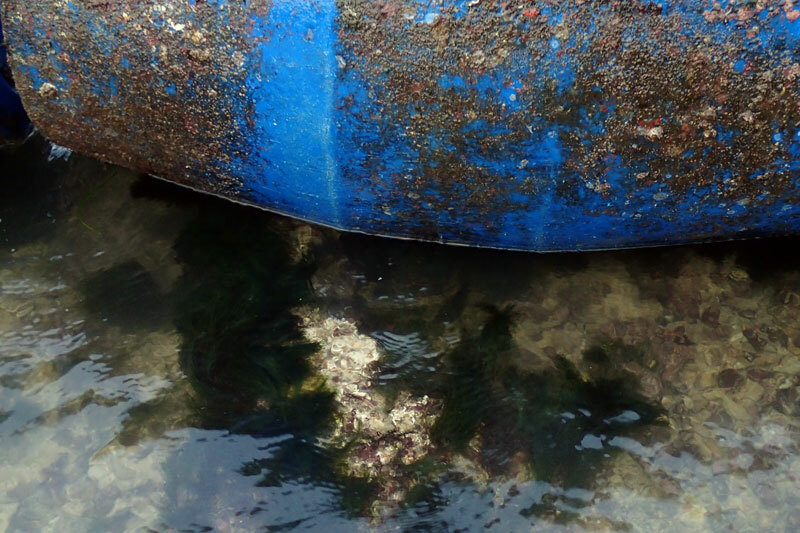 However, I am certain that the floating barriers have caused some damaging impact on some parts of the reef. 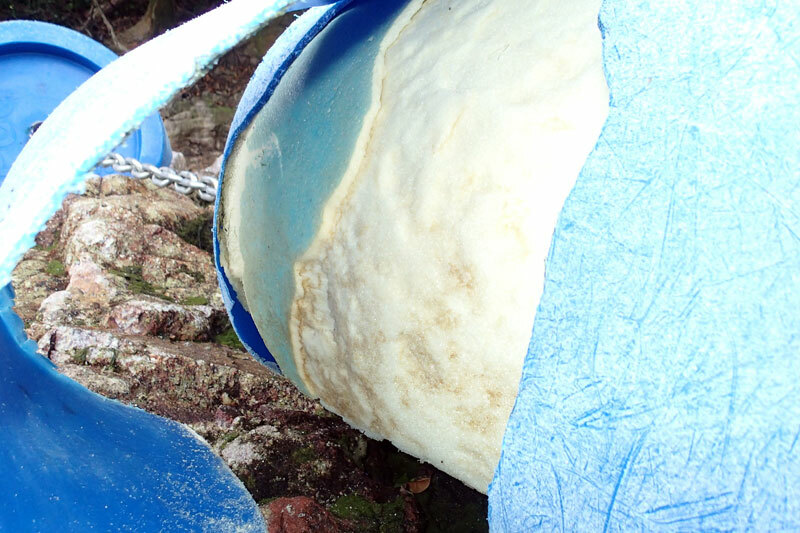 Furthermore, the disintegrating foam from the broken barrier on the high shore is also of great concern.